We've entered the twilight of our civilization. The best pope in generations sez that anyone who wants to build walls like Donald Trump isn't a Christian. The actual quote: “A person who thinks only about building walls, wherever they may be, and not building bridges, is not Christian. This is not in the Gospel." 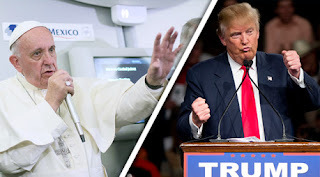 Trump counter-attacks, calls pope a loser who dresses funny and can't even get a date. no, what the Trumpster said was, he is proud to be a Christian. Since meekness and lowliness of heart is supposed to characterize the disciples of Jesus, it's pretty clear Trump doesn't know what he is talking about...but Francis deserves points for telling truth to power. I have absolutely no love for Trump. However, the Pope should stay out of U.S. elections.